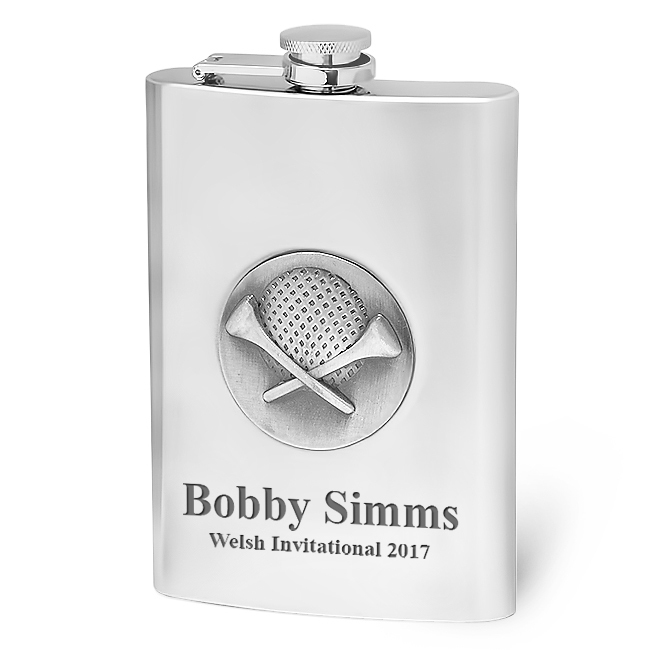 Take along this stainless steel flask on your next round of golf, and be ready to celebrate or commiserate at the 19th hole with your buddies! 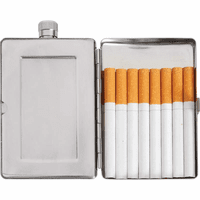 The flask has a captive screw-on lid that is leakproof, holds up to 8 oz. of your favorite liquor, and has an emblem on the front, featuring dimpled golf ball centered between two crossed tees. Add free custom engraving below the emblem, and we will package your gift item in a handsome box! Dimensions: 5 1/4" x 3 3/4" x 7/8"
How the carrying pouch looks like? How much is the shipping for an order of 90$ if I'm from Canada? 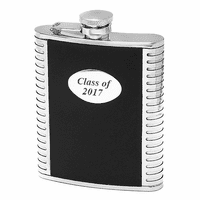 Here is a link to a picture of the pouch: http://www.executivegiftshoppe.com/flask-pouch.html For the shipping, below the Add to Cart button there is a shipping calculator. Enter your country and postal code here to get the shipping rates to Canada. Is the engraving laser or router? The engraving is done with a diamond tip router engraver. 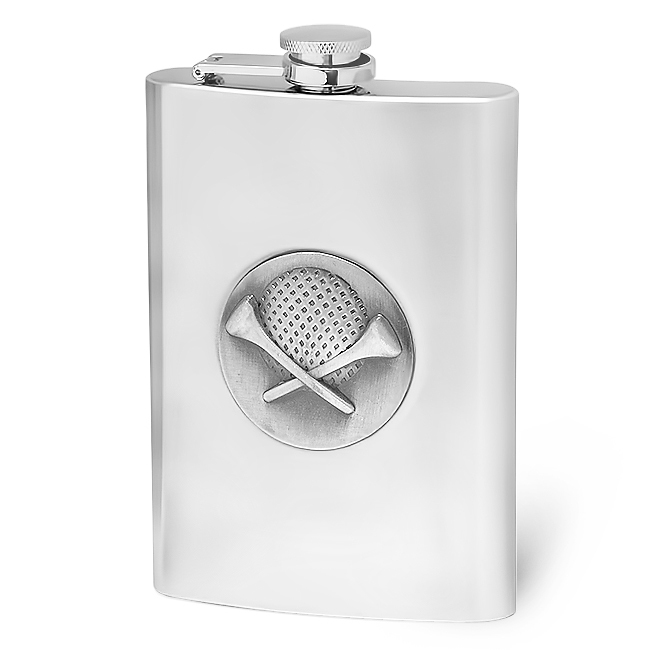 I am looking to buy 3 Golfers Hip Flasks. I have tried to get the engraving pre-view to show whole name but it doesn't seem to be able to it. How many characters can be used for the engraving. Have you tried reducing the font size? This should work. If not, we would still be able to fit the names, our engravers would just make the font size a little smaller. where was this flask made? how thick is the stainless steel? This flask was made in China. The stainless steel is .4mm thick. Does the top screw on? Yes, the top does screw on. It is a captive top, which means it is attached to the flask as well. Do you get a discount for ordering 120? Does it come in a gift box? Will you put a logo on it or just initials? Can there by four initials such as HBAV? You can absolutely get a discount for ordering 120. We'll email you separately with a coupon code to use. It does come packaged in a gift box. We can engrave a logo and then you could also add initials if you wanted. Or you can have just initials engraved. Our Standard shipping would be $2.50 for orders under $25 and free for orders over $25 within the USA. Your flask would ship via first class mail with standard shipping and would take between 3 and 5 days to arrive. I love this flask. It's perfect on the course for my Birdie Juice. Great quality. Quick shipping! These were engraved so quick I thought for sure they would not look good! But they are perfect! 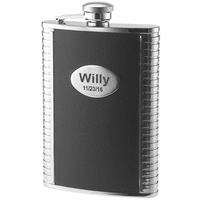 Our flask shipped quickly, was engraved perfectly and the recipient loved it. Thanks! The order came quickly and was a great value. My only complaint is the engraving - it was difficult to see. If I didn't know it was engraved I wouldn't have seen it. Sent wrong items the first time. Second time forgot to inscribe the items. Two times and never got what I ordered. Merchant Response:We're so sorry for your poor experience. We did send the wrong items the first time so we overnight shipped you the correct items. We are showing that they were engraved though, the engraving was done right beneath the golf emblem. Could you email us at help@executivegiftshoppe.com if that's not the case so we can resolve this for you? ConsSent wrong items the first time. Second time forgot to inscribe the items. Two times and never got what I ordered. I bought this for my golf buddy, she was surprised and pleased to receive it. The quality is very good. I hope she enjoys it. 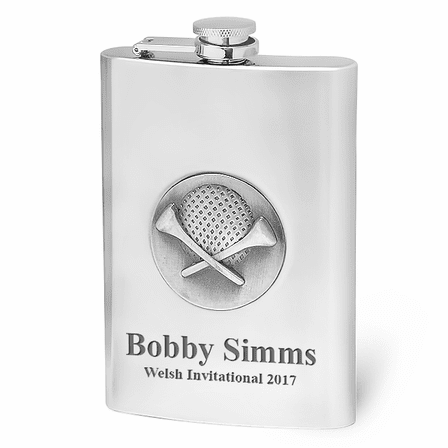 JUST RECEIVED MY ORDER OF GOLF HIP FLASK HAD THEM ENGRAVED. THEY ARE BETTER THAN YOU CAN IMAGINE. MY CITADEL BROTHERS ARE GOING TO BE IMPRESSED. ProsFAST SERVICE, GREAT PRODUCT. WILL DEFINITELY BE USING THIS COMPANY AGAIN.